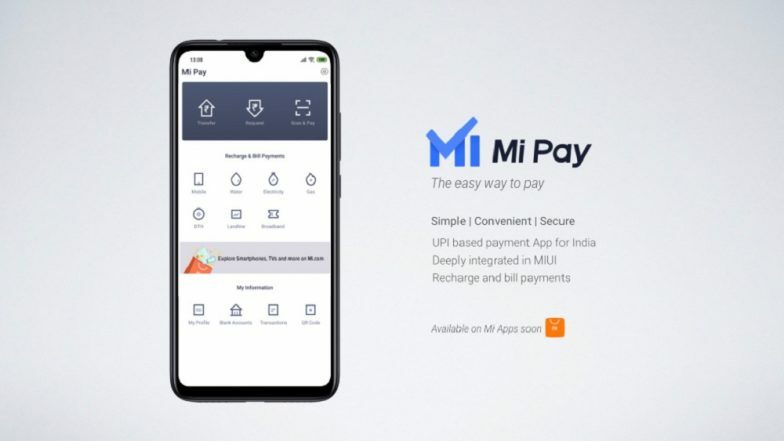 New Delhi, March 19: Aiming to take on the likes of Google Pay and Paytm, Chinese handset maker Xiaomi on Tuesday launched its Unified Payments Interface (UPI)-based payments application "Mi Pay" for its MIUI users in India. According to the company, the Mi Pay service aims to be an all-in-one payments solution for its users. It would be available for all Xiaomi devices running its proprietary MIUI OS based on Android. "Payments for us is a core functionality within our operating system (OS) business," Manu Jain, Vice President, Xiaomi and Managing Director, Xiaomi India, told IANS here. The app is integrated within MIUI interface across SMS, contacts, scanner, app vault and settings and ICICI Bank is the payment service provider. Xiaomi Poco F1 Lite Smartphone Specifications Leaked Online; To Get 4GB of RAM & Snapdragon 660 SoC. The #MiPay app is a one-stop solution to all your payment needs. With Mi Pay, you can seamlessly split bills, transfer funds and request money all at the tap of a button. Users can effectively make payments using UPI and other debit cards, credit cards and Internet banking across more than 120 banks and over 120 billers. "We have introduced our innovative Mi Pay service for our consumers in India. This is the ultimate solution to a variety of consumer payment needs, and hence empowers millions of Xiaomi users with access to digital payments," said Muralikrishnan B, Chief Operating Officer, Xiaomi India. The payments service would also allow several utility payments ranging from phone bills, phone recharges, water or electricity bill payments. Mi Pay provides safe and secure transactions with all data stored locally in India servers in an encrypted format, the company added. Mi Pay UPI has been approved by the National Payments Corporation of India (NPCI) under the multi bank Application Programming Interface (API) model and it has been audited by CERT-IN empanelled auditors E&Y and Lucideus.